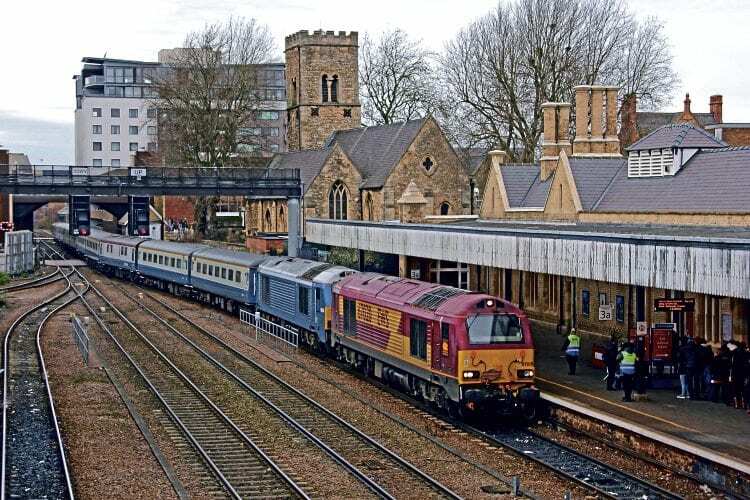 CHARTER operators once again headed for Lincoln’s enormously popular Christmas Market in December, bringing several special trains and hundreds of visitors to the city. December 8 saw West Coast Railways operate a long-distance train from Linlithgow for the Scottish Railway Preservation Society (SRPS), with Nos. 47237 and a Class 57 topping-and-tailing the society’s BR maroon Mk1 set. DB Cargo’s No. 67024 – recently repainted in Pullman umber/cream. The following day brought two more DBC ‘67s’ to Lincoln, hauling Pathfinder Tours’ ‘Lincoln Shire Explorer’ from Taunton. EWS red/gold No. 67020 and Arriva turquoise No. 67003 double-headed Riviera Trains’ immaculate BR blue/grey Mk 2 set, which called to set down at Lincoln Central before continuing to Barnetby to run round and stable during the day. The only steam-hauled special of 2017 was The Railway Touring Company’s ‘Lindum Fayre’, worked from King’s Cross by No. 46100 Royal Scot. The rebuilt ‘Royal Scot’ was standing in for No. 46233 Duchess of Sutherland, which is currently out of traffic for repairs and a repaint in LMS crimson.